@TakeitEasyAlan do you have the JAVA_HOME set under System Variable? I had the variable set for my user but not as a system variable so was able to run it via command line but not via NSSM. Yes It was setup correctly? strange! same thing happened with me. the Solr service is set to paused, I don't know why. and the powershell is unable to start the service. I am seeing similar issues. It appears that nssm is creating the service with the executable path set to nssm.exe's path, instead of the path to the solr.cmd file. I even tried using the nssm GUI and it does the same thing. This script won't work for Windows Server 2012 R2. Instead of using -FriendlyName to find an existing cert, switch these (there's a couple instances) to Subject -eq "CN=$solrHost" and then remove the -FriendlyName from New-SelfSignedCertificate. Am I correct in saying your script will install NSSM below c:\solr? If so, is there a particular reason for that or could it be installed elsewhere? &"$installFolder\nssm-$nssmVersion\win64\nssm.exe" install "$solrName" "$solrRoot\bin\solr.cmd start" "-f" "-p $solrPort"
I basically added "start" after "solr.cmd". Then everything worked. Further edit. I had to make the above change as I was originally running the 32 bit Java RTE. I then decided to revert my checkpoint and install the 64 bit RTE instead - and there, the script failed when I had "start" as part of the start command. Not exactly sure what the root cause is for this change in behaviour - but it might explain a few things. Any idea how to fix this pause thing? Make sure you're installing Java SE Development Kit 8 (and not 10) and remember to change out the $JREVersion accordingly (as of today it should end in 171 not 151). Used Chocolatey to install jre8 8.0.181. This installed both 32 and 64 bit versions. Had to uncheck the x86 architecture in JRE settings for user. 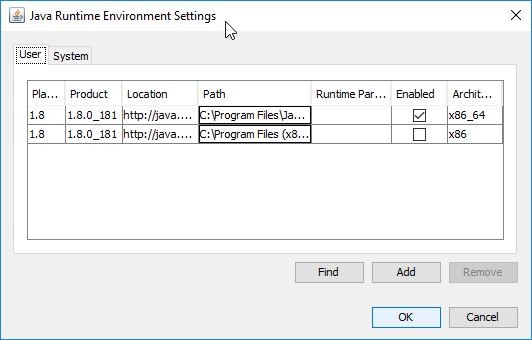 You can reach to the settings by opening 'Java' from control panel. In the script I changed $JREPath = "C:\Program Files\Java\jre$JREVersion" to $JREPath = "C:\Program Files\Java\jdk$JREVersion\jre" and everything ran fine. Using 1.8.0_191. Can someone explain to me why this isn't incorporated into Sitecore Installation Framework, this worked a charm for me incredible thank you. Update: just noticed your SIF extension nice work. For all the people suffering with the paused SOLR service, you need to add restart to the command in NSSM GUI. I found that out after running the command from CMD. The port is optional since it's a default.